The SuperRoom 9′ x 9′ Soil LED Indoor Grow Room Package is a professionally designed, fully automated LED grow room package that comes complete with everything you need for a smooth and easy growing experience. 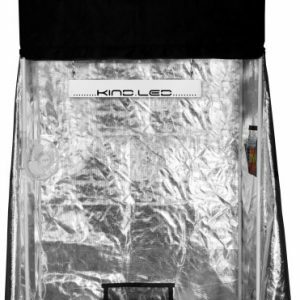 SuperCloset’s all-in-one, turn-key, LED indoor grow room tent package makes indoor gardening simple and fun! The SuperRoom 9′ x 9′ Soil LED Indoor Grow Room Package is a professionally designed, fully automated LED grow room package that comes complete with everything you need for a smooth and easy growing experience. Grow like a professional! 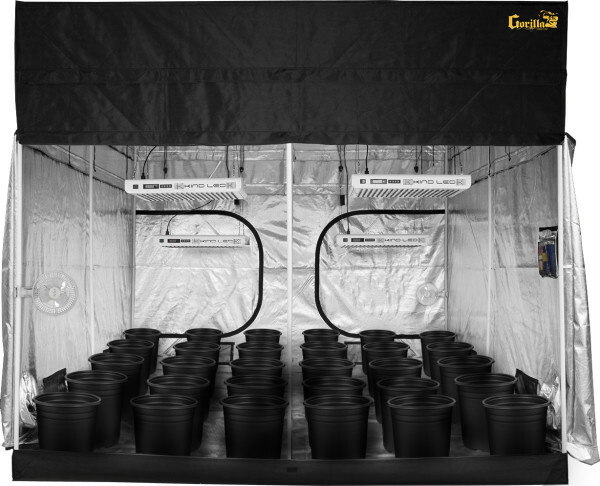 The SuperRoom 9′ x 9′ Soil LED Indoor Grow Room Package includes a 9′ x 9′ Gorilla Grow Tent; four Kind LED K5-XL750 grow lights; Thirty 5 gallon soil pots; timers for complete light cycle automation; a Phresh carbon scrubber & filter; digital readout thermometer / hygrometer; an internal circulation fan; an adjustable net trellis system; an electrical GFCI adapter; a pH Testing Kit; a TDS Meter; a TechnaFlora Nutrient Bundle; an instructional DVD and a 3 year warranty! The very best and tallest, thickest, and strongest grow tent available. This is the only height adjusting grow tent available worldwide. GROW STRONG! They’re soil buckets, what can you say? Actually, plenty. These heavy duty pots feature a reinforced rim making them strong enough to pick up with heavy plants. They feature a side and bottom drain design for superior drainage and offer a wide base for increased stability and the development of a more robust root mass. Trust us, these soil pots are tops. These Kind LED grow lights use only about half the electricity as HPS lights, and produce much more yield per watt. Many studies have even show an increase in oil production and quality, closer inter-nodal spacing, and denser fruits and flowers. Also, because these Kind LED grow lights produce less heat, they do not need to be air-cooled like HPS lights, therefore eliminating the need for additional fans, which also makes them run quieter. Click here for the full specifications of the K5-XL750. This commercial grade, high performance fan is made of steel with a durable powder coated finish. It is made with quality UL listed components for reliable and quiet operation. Take the guesswork out of knowing when your plants need water. The included Bond Moisture Meter will quickly and accurately measure the water content of your soil at all levels in the soil pot. Easy to read display will tell you when your babies need that sweet, sweet nectar of the gods. No batteries needed. Technaflora Plant Products Ltd. prides itself in manufacturing exceptional quality plant nutrients and additives. This starter kit includes 10 different nutrients to get you going. Want enough to last the whole season? Upgrade to our Nutrient Super Pack! Our light timer gives you the power to control the sunrise and sunset automatically, allowing you to control the season, and ultimately dictate whether your plants vegetate or produce beautiful fruits and flowers. Say hello to stress free vacations! Each LED indoor grow room comes with an instructional DVD, the Grow Tips manual, a 3 year warranty, and lifetime customer service. With your SuperRoom you will harvest better on your very first yield than people who have been growing for years. You will receive lifetime grow support and consultation along with a great DVD. All SuperRooms are easy to set up, fully automated, and come with A+ BBB customer service. Competitors will sell to you and forget you. Don’t grow alone, grow with support. Welcome to the Super Family. Your plants will benefit exponentially from the additional wattage and footprint provided by this lighting upgrade. You will see increases in the density and the fullness of your fruits and flowers. Give the plants more of what they need to thrive and they will reward you for it! Are the novelty seeds you want to grow hard to find? Are your obscure seeds of choice pricey? Do you want to ensure that every one of your precious starters makes it through to harvest? Well then, you NEED the Total Germination Package! This package includes EVERYTHING that you need in order to maximize your chances of having all of your precious babies blossom into adolescence. You will be able to significantly increase your germination success percentages with this all-inclusive kit. The Total Germination Package includes a Seedling Tray, a Humidity Dome, a Seedling Heat Mat, a Heat Mat Thermostat, and Rock Wool Cube Medium. Gorilla Grow Tents include a patent pending adjustable 1′ height extension kit that gives you the ability to increase your growing height from 7′ to 8′ tall. This 2′ height extension kit will give you the ability to take your tent up to 10′ tall! Your plants can grow up to 50% larger. With this upgrade, never again will you have to worry about your plants out growing your lights and room. You can also now experience crouch free maneuvering without banging your head on low hanging lights. “Grow with the Best, Harvest the Best.” Your quality and yields are only as good as the room you grow in. Made for beginners, essential for professionals: if you are not growing in a Super Room, you may as well not be growing at all! The incredible Gorilla Grow Tents provide the strength, support, and durability of an actual enclosed room. They are height adjusting and can be quickly and easily adapted to become taller than any other grow tent. This means that your plant size and and yields will increase dramatically. In fact, due to the increased growing area and easily managed consistent climate, your product quality will also vastly improve. At 1680D, the Gorilla Grow Tent is up to 3x thicker than any other tent. This increased insulation makes them more smell resistant, bug resistant, light tight, and quieter than any other option. You need never worry about heavy and expensive components falling and breaking, crushing your grows, or creating electrical fires or floods. These tents will make all of the difference in your quality, yields, ease of maintenance, and overall growing enjoyment. Whether it’s the SuperPonics 16 combining top feed and DWC, the Super Bubble Flow Buckets with their patent pending “upwelling recirculation large yield buckets or SuperFlow’s first ever “non-clogging” aeroponics system, you are assured the best, easiest, fastest, and safest grows over any other method. The SuperPonics Method combines the fusion of different proven hydroponic methods into one, creating unparalleled yields in quality and total. These systems are incredibly easy to use and are fully automated. SuperPonic Method systems grow up to 2-5X faster and bigger than any single traditional hydroponic method. SuperPonic Method systems are also safer due to the fact that if one of the methods goes out for any reason (air pump or water pump) your plants will still survive and thrive. Your hydroponic system is the heart of your setup. Many tent packages don’t even include a hydroponic system! The few that do include a hydroponic system almost always outsource the unit, selecting their cheapest option. These inferior systems can slow your growth, can cause root rot, create poor quality, and are often times very difficult to use. If you want to grow the best, you must grow with the best. Your Soil SuperRoom has everything you need to grow your babies in the beautiful soil of your choice. Your Soil SuperRoom has everything you need to grow your babies in the beautiful soil of your choice. Growing in soil can be a very forgiving and rewarding experience. While the pace of growing in soil or soil substitutes can be slower than the hydroponic alternatives, the simplicity of the process can lead to a stress free grow for many first timers. Many people already possess the basic knowledge necessary for growing in soil. From house plants, to our outdoor gardens, the soil grow has been with many of us for most of our lives. Applying that same practice for your indoor SuperRoom will be an intuitive transition. All of the SuperCloset SuperRooms come with soil pots and spill trays, as well as a moisture meter so you will always know when you need to water your growing babies. Even if growing in soil is a new experience for you, the top ranked SuperCloset Grow Support Team will be there to guide you every step of the way for the lifetime of your system. Grow Strong and Grow Super with SuperCloset Soil SuperRooms! After years of rigorous research and development, the KIND LED Grow Light is complete, and it is a complete work of art. The K3 series LED grow lights are comprised of high powered 3 Watt Light Emitting Diodes featuring a proprietary intensified 12 band spectrum, which includes both infrared and ultra violet diodes designed for flowering large yields. This revolutionary series of LED grow lights will produce the biggest and best yields, while consuming approximately half the electricity and producing virtually no heat. Your Kind LED Grow Light will cultivate record breaking yields, both in quantity and quality, while running quieter, cooler, and more efficiently than any other grow light. Guaranteed. Our SuperRoom LED Grow Room Package comes with everything you need to get growing right away, including all of the necessary timers so that your grow room is fully automated, giving you, the grower, very little maintenance. Your time is precious and we want you to spend it on enjoying your harvests, not laboring over them. You will not believe how simply and easily you will be achieving exceptional yields, even with little or no prior growing experience. You can leave for up to an entire week at a time, while your SuperRoom is growing perfectly fine. 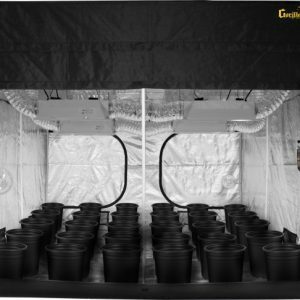 Most other grow tent setups are, at best, only partially automated, and are often times set up incorrectly. This leaves you with having to spend hours a day in order to properly maintain an incomplete grow room. Any time that you are mixing 100’s of watts of electricity with water and indoor growing, safety must be a FIRST! SuperRooms are designed with safety in mind, as they all come with the proper ground fault plug-ins, safety electrical power boxes, and proper electrical cords. This means that you will only need to utilize one or two electrical outlets. It is very important for you to grow in a safe, stress free environment; to grow in peace without worrying about major hazards or disasters. Other grow rooms leave it up to you to figure out what electrical cords, boxes, and safety plug-ins you will need to correctly set up your indoor grow room. If you use the wrong cords, electrical box, or do not use a proper GFCI plug, you risk an electrical fire, back surges ruining your lights, or even electrocution. Grow safe, grow SUPER safe. You need everything to grow properly, not just a few of the more commonly known components. A TDS digital nutrient meter is essential to know exactly how strong your hydroponic solution is, as is the PH testing kit, to know your PH. 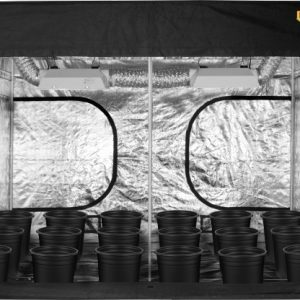 With SuperRoom grow room setups everything is included and explained with the accompanying manual, including a starter kit of the very best TechnaFlora Recipe for Success Nutrients. Most other grow tent packages neglect these important components because they think you won’t notice!